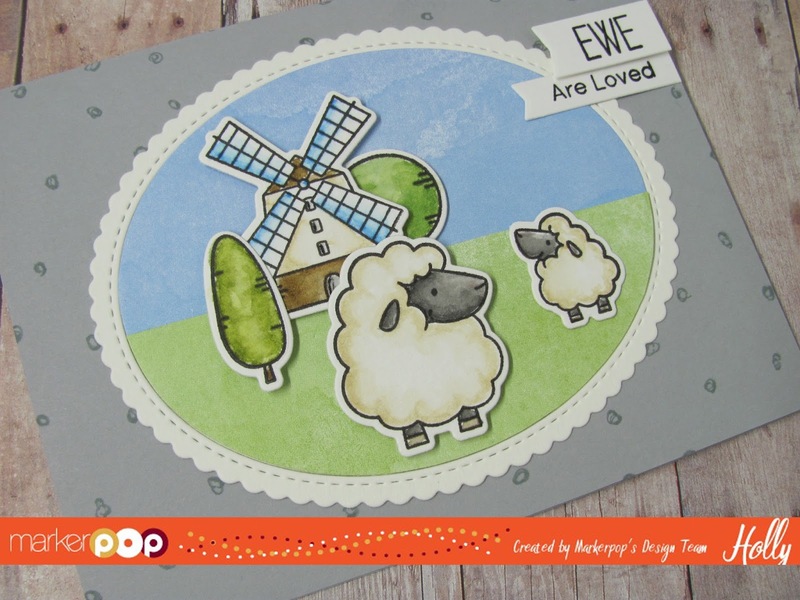 Hollybeary Creations : Ewe are Loved! It's time for a new Challenge at MarkerPop and this week it's all about Watercolor. All month long the Design Team are using Watercolors and we will be sharing techniques and inspiration with different watercolor mediums. (2) Winners for a Prima Confections Watercolor Pans Set Of 12 in Pastel Dreams and a Zig Watercolor BrusH2O ~ Long Detailer Tip. and (1) Grand Prize Winner for The New Winsor & Newton Cotman Watercolor Brush Pen Set Of 12 . This week's Challenge is all about using Watercolors with Animal or People images. I used the adorable BB Ewe are the best set from My Favorite Things. I stamped the images onto some Watercolor paper and colored them in with Distress Markers and a Damp paintbrush. I created a faux background using some of the Lawn Fawn Watercolor Wishes 6x6 Papers. 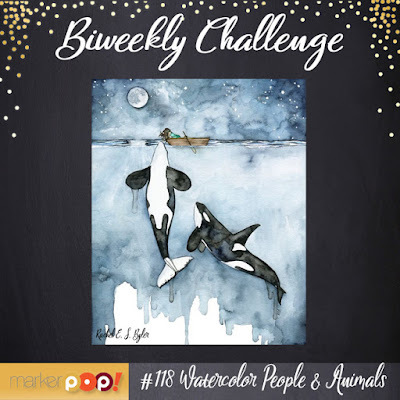 One of the ways you can Enter to Win our Watercolor Giveaway this month is join us for both or Challenges. The challenge is open until May 5th.. We hope you will join us! Distress Markers~ Antique Linen, Salty Ocean, Vintage Photo, Peeled Paint, Mowed Lawn & Black Soot. Stamps~ (MFT) Circle Scribbles Background & BB Ewe are the Best. Dies~ (MFT) Ewe are the best coordinating dies, Blueprints 27 & Stitched Oval Scalloped Edge Frames Die-Namics. Ink~ VersaFine Black & Lawn Fawn Hippo.